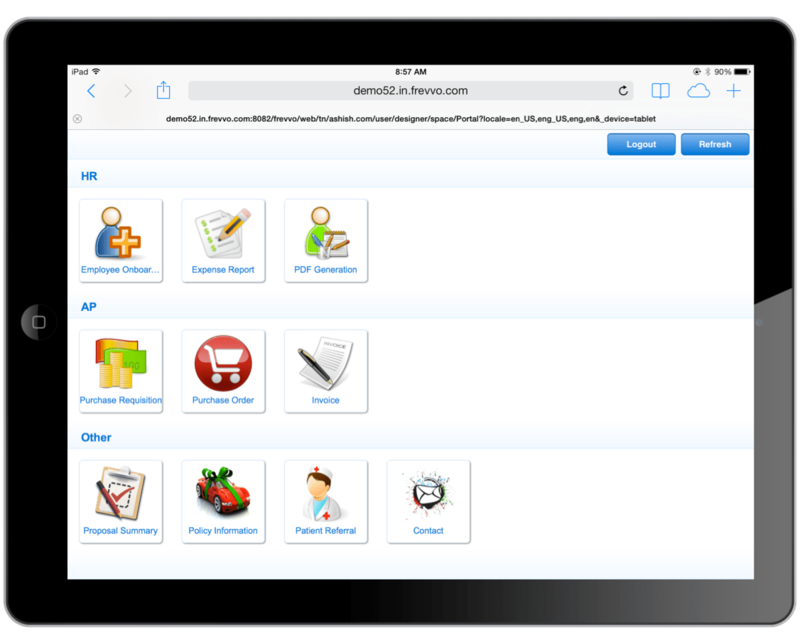 Nowadays, most business software will sport the any device tag meaning you can use it on your phone, tablet or desktop. But all too often, this means adding some media queries to the existing desktop web application and throwing it on a mobile device. Usually, the result is a terrible user experience (UX). Similarly, for web designers, mobile first has become the ‘buzzword du jour’. Mobile first prioritizes mobile devices over PCs and other devices. Might make sense for games, social networks etc. but blindly following this paradigm for enterprise apps also leads to a terrible user experience – see Windows 8 on the desktop. Let the business engineers design forms and flows to meet business requirements. We’ll take care of providing the natural user experience everywhere. We’ve invested tons of effort in this area. I’ll highlight a few items below. All this works without the form/flow designer having to do anything. Bigger everything: controls, buttons and icons are automatically a little bit bigger on mobile devices so they’re much easier to select or click with your finger. 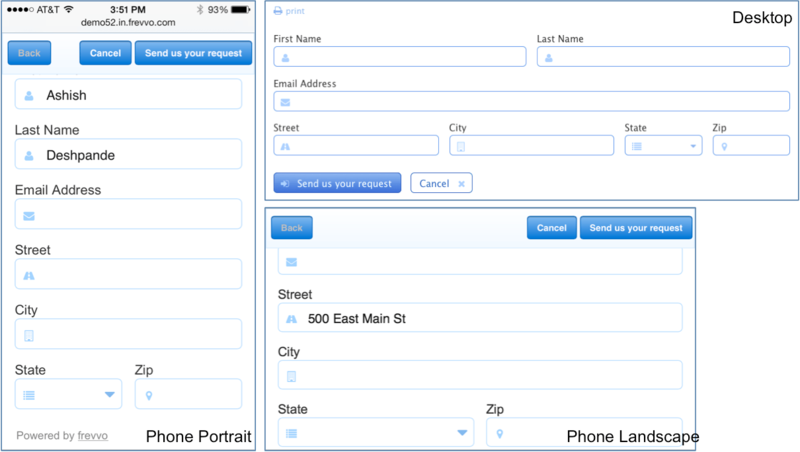 Responsive: frevvo forms will automatically adjust to different screen sizes and orientations. Where it’s not possible to adjust the layout such as a Table, frevvo will add a scrollbar. It’s not easy – even Amazon and GMail can’t get it right. Navigation: Break up a long form into multiple pages using a PageBreak control. frevvo will automatically add Back and Next buttons and enable/disable as necessary. Look & Feel: Decorators & Styles provide that extra quality that makes for a beautiful and enjoyable UX. And, you can customize the appearance to suit your tastes without compromising the people first approach. 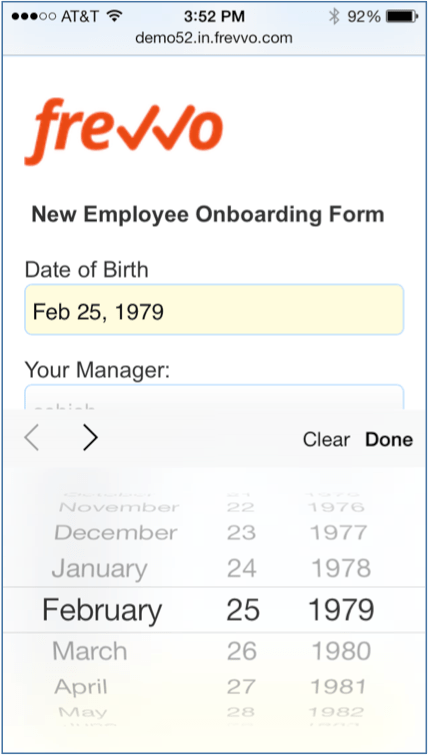 Mobile aware controls: On mobile, date controls use the native picker as do drop down controls. Users can sign with their finger on the touch screen. Upload controls can use the camera to attach photos. Geo location uses the device’s built-in GPS. Spaces: these handy mini-portals that come with frevvo look totally different depending on your device. On a mobile device, the user experience is natural – touch large icons with your finger vs navigating a drop down menu. Task List: it looks and works differently depending on your device. As before, the priority is people first natural usability everywhere. We’ll continue to invest more and more so customers don’t have to worry about CSS3 and HTML5 and can simply focus on their business requirements and be sure of a great enterprise UX. If you got all the way here, thanks for reading! We’d love to hear from you. Watch one or more short videos to quickly learn more or contact us for more information. Next Post Best SQL Joke Ever?